If you have already finished the initial setup of ACCOUNTS and gotten to the main window, please skip down to the section on Passwords towards the end of this Help page. You can also get to this window via the File ⇒ New Database menu option. 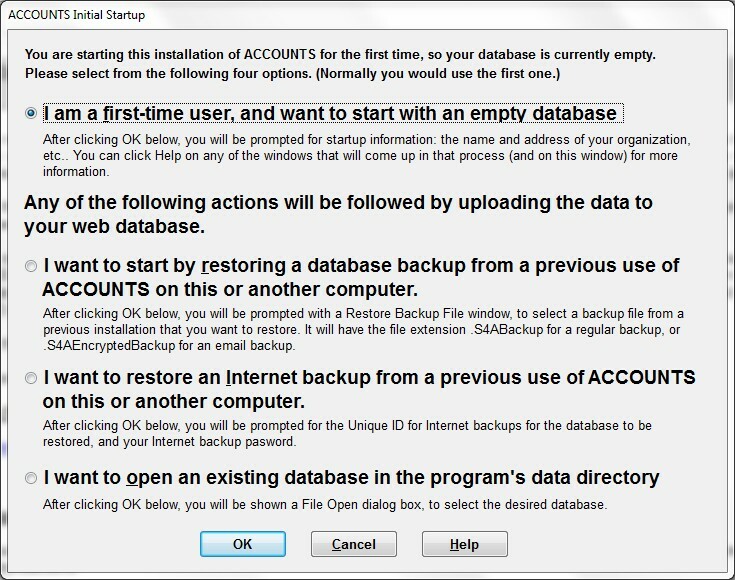 Users who have a backup database from a previous installation, either because they have to re-install after getting a new computer or having their computer rebuilt, or because they are transferring the program from another user in their organization, should pick the second or third radio button option (depending on what type of backup they plan to restore) and click OK. Users who already have databases and somehow get to this window by mistake can select the fourth option, to prompt to open an existing database. If you selected the 2nd option, to restore a backup database, please see Restoring Backups for more details about the restore process. The startup windows described in the section below will not be shown. The fourth option allows you to re-open an existing database that has been used in the program before. In the more usual case where you selected the first option in the initial startup window, for new users, the program will prompt you with several additional startup windows before you can start entering transactions. In this window, you enter your organization's basic information (name, address, fiscal year start if different from the calendar year etc.). You can also come back later and change this basic organization information with the Maintenance ⇒ Organization Info window. This window prompts you with a number of options about how your chart of accounts should be initialized. Once you are finished with that, you go on to the following window, where you can make further detailed edits to your chart of accounts. This window lets you add additional accounts to your Chart of Accounts, and/or edit the ones that are there already. (It uses the Maintenance ⇒ Chart of Accounts window.) Depending on your choices in the previous window, either an entire chart of accounts may already be present, or at least an account for your General Fund will already be there. If you do not yet have a license key for your organization for ACCOUNTS, or have not yet installed it on this computer, the next thing you see will be the Evaluation and Licensing window. Please read the Help on that window for details. During your initial evaluation of ACCOUNTS, you can just click Continue on that window to go on to the main window. There are a couple of passwords you can set up in the program, for program entry with different permissions, and other purposes, with the Maintenance ⇒ Change Password sub-menu options. See the page on Passwords in the Program for full details. For the Web Network Version this is done differently, with login email addresses and passwords, not just passwords. You may want to use the Maintenance ⇒ User Administration ⇒ Administer All Users and Maintenance ⇒ User Administration ⇒ Edit Your Login menu options to add additional users and set their permissions, or change your own login including your password. See Web Network Version User Management for full details. One thing you must do is set up your chart of accounts with Maintenance ⇒ Chart of Accounts. Unless this is a complete startup organization, with no financial history, you will want to enter your Opening Balances in all accounts that have balances as at the date before you are going to start entering transactions into ACCOUNTS, with Actions ⇒ Opening Balances. Another setup step you may wish to do before you start using ACCOUNTS includes selecting your organization's desired naming for various classes of accounts, and various reports, with the Maintenance ⇒ Entity Names window. See also: the Regular Operating Procedures page for an introduction to your daily activities.